Cinematic Paradox: "I'm not running away, I'm coming home." "I'm not running away, I'm coming home." Starring: Reese Witherspoon, Robert Pattinson, Christoph Waltz, Paul Schneider, Jim Norton, Hal Holbrook, Mark Povinelli, Richard Brake. To be honest, the movie world has been a little unfair towards Robert Pattinson. Okay, so his big claim to fame is being the object of many teenage girls (and, you know, those Twi-mums) desire by playing an 108 year old grumpy virgin vampire in the most annoying series of movies and books ever to see the light of day (or not, since they're all about vampires). And, let's be fair, these teenage girls and their mums only like him for one thing: his apparent good looks, not his acting skills. So we've all just written him off, thinking that every movie we see him appear in will be just as terrible as the angsty vampire ones. He was quite good in some of the little indie flicks he did before he appeared on 'I Love Edward' t-shirts hidden beneath sweaters. He wasn't so good in Remember Me (that ending still pisses me off a whole 15 months after I saw the damn thing). 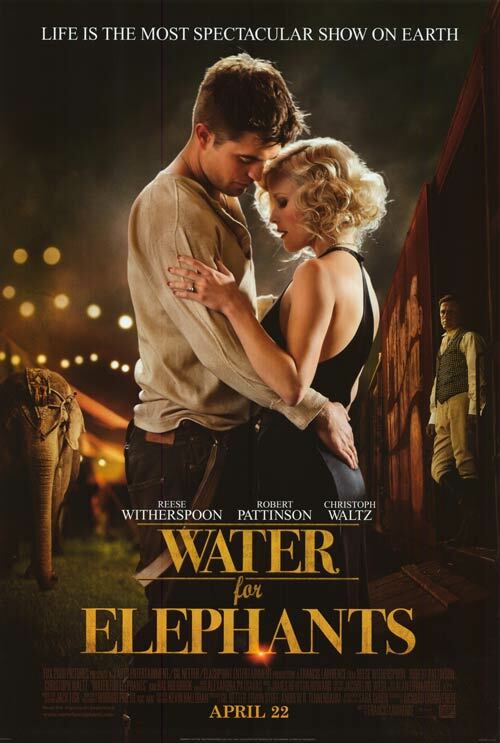 But along comes Water for Elephants, an adaption of Sara Gruen's best seller that is very Hollywood and comes when R-Pattz is still kinda in vogue, and it's not all that bad. Well, judging by the way we treat old Robert Pattinson, it could have been a lot worse. R-Pattz is part of another love triangle again, just this time he isn't in high school and pining after K-Stew (who we all know cannot act). The object of his affection is Marlena Rosenbluth (Reese Witherspoon), a beautiful circus performer who is married to the Benzini Brothers circus owner, August (Christoph Waltz). But their love affair comes a lot later in the film. Pattinson plays Jacob, a veterinary student who abandons his studies after his parents are killed. He decides to leave home, and never look back, which is when he climbs aboard a circus train. At first, he isn't welcome, but because of his veterinary knowledge, August thinks that he might be helpful around the circus. After the star attraction horse is put down, August replaces it with an elephant, which Jacob is put in charge of. To be honest, it's not really a love triangle in this movie. It's more a love square, if you add the elephant. Because the elephant rocks! Of course, thanks to it's hopelessly over-done love triangle premise, Water for Elephants isn't a surprising film, nor is it an amazing one that everyone should run out to see. But, as I've probably said before, I'm a sucker for anything set in the 1930s, so it was a given that I'd like Water for Elephants as much as I did. While I just plain enjoyed it, there were a lot of things that the movie could have improved on. The first: it could have been more romantic. Now, I don't just mean that the script could have had a little more romance in it. I mean that the cinematography could have been a little more romantic. Like, Sofia Coppola should have made this film, because it would have been more magical (or, um, slow...). However, considering Francis Lawrence's career is made up of such action-thrillers as I Am Legend and Constantine and a whole wad of music videos, he didn't do such a bad job. He captures the mood of the 1930s quite well - perhaps glossing over how bad the Depression really was - and does make quite a spectacle over the few circus sequences the film has. Then comes the chemistry between the three leads. Each character is very interesting and very detailed, which I really liked. However, there were many times when I thought that Reese Witherspoon just wasn't right with either of the two men. And, I know it's bad, but I just felt like Christoph Waltz deserved a higher-calibre of actors to surround him (which Carnage has all sorted out for him), because despite the efforts by both Witherspoon and Pattinson, his sheer presence just shot them down a few levels. Now, I could be saying this because I love Waltz and everything he does, but his work was absolutely brilliant here. He toys with his villainous role with just a simple look, and while his character is not quite Hans Landa, he sure is better than Chudnofsky guy he was given in The Green Hornet. However, enough about Waltz. Witherspoon and Pattinson still do good work in each of their roles, but as a team, they never do feel like a couple. This lets down the vital spark needed in this film, but in the meantime it is fascinating to watch Witherspoon's seemingly trapped circus performer and Pattinson's broken and broke young student. While there was plenty that went wrong with this film, I did really enjoy it. The circus atmosphere was fun and intriguing, along with the many interesting characters that made up the circus life. There were a few moments of really high tension and the film never really lost my attention. Bookended by Hal Holbrook playing an older Jacob reminiscing about his days with the circus provides a bittersweet tone, which is probably bound to get a few tears from the weaker audience members. I think that Water for Elephants still exists in the world of 'what could have been', but I really liked what it was, and it definitely shouldn't be completely written off. Because, after all, most fans of Twilight probably don't have the mental capacity to handle Robert Pattinson in a film as good as this. Yeah I didn't hate it either. It was okay, but my goodness, it had so much potential! Waltz was great in this...he was so much scarier than Landa. Witherspoon should stop with these roles...she looked so cruel for some reason throughout the film. Now coming to Robert Pattinson, this is what I think of him- he isn't a bad actor, he's just utterly expressionless, which is not a bad thing. Look at Keanu Reeves- Pattinson should really follow his footsteps. Oh and about Remember Me and its ending- I KNOW RIGHT! It was going fine, and then it was such a pathetic depressing ending. Makes on think that because he is the 108 year old virgin vampire in one series of films, he is adamant on dying in the stupidest ways in others. Ugh. I was surprised how much I enjoyed this flick, and I pretty much agree with you as to why. I didn't entirely buy the chemistry between Witherspoon and R-Pattz (sidenote: I am definitely using "R-Pattz" from now on whenever I describe him), but I thought he was really strong when interacting with the other circus folk. Of course I also thought Waltz steals the show (the scene where he "directs" the two of them was excellent). The film is also quite beautiful - elegantly lit, with great production design (although I can't help it feel it probably romanticizes what actual travelling circuses were like). All in all, far stronger than anyone would of expect. I don't think Remember Me was that bad... As for this one, I also liked it much more than I had expected (my mom made me watch it with her). You're right though, that it lacks some romance, because the "love" seems a bit unrealistic without it. What a splendid review, Stevee! I totally agree that R-Patz is a better actor than people unfairly gives him credit for. I had originally planned on seeing this movie but Netflix doesn't have this to rent yet so we settled on Starter For 10. I still want to see this, really curious to see Christoph as he just blew me away as Hans Landa. I kind of thought that Reese was a bit miscast in this, and she's just not in the same league acting wise as Christoph despite her star power. Not sure about Sofia Coppola directing this, Somewhere was such a total bore for me... I think I only like her work in Lost in Translation. Hmm, I'm not sure whether I should check this one out. I mean, it reminds me of Moulin Rouge, which I loved. But there's something about the lead pairing that gives me chills. Nice to hear that the characters were layered, that's always a bonus in a romantically inclined film. Nikhat - Pattinson is pretty expressionless. When he smiles, it actually creeps me out. He should go have a bath. Good lord...that ending was just awful. I wanted to gouge my eyes out. Literally. Tom - R-Pattz is how I always describe him! It was far stronger than one would expect. And yes, the scene where he directs them is great! Mette - Remember Me wasn't that bad, but the end really killed it for me. It did lack a lot of romance, which was kinda dumb! Ruth - Thanks! You should definitely watch it, it's quite a solid film. I felt that Reese was miscast, because of Waltz. I mean, Waltz is really in a league of his own. Haha, I'm one of the few that really liked Somewhere...even though it really is boring. I really like Coppola, for some strange reason. 5plitreel - This is kinda like Moulin Rouge without the musical numbers and it's far less lavish. But it's still worth a watch!